Putting Martial Arts in its Proper Perspective in Today's World. "The ultimate aim of Karate lies not in victory nor defeat, but in the perfection of character of it's participants." We call our style "Tae-Sho Shotokan Karate". Our roots are Shotokan (form's, basics, stances), we have adopted some of our kicks from Taekwondo and bits and pieces from other styles. "All things evolve in order to survive." Class dues are $10.00 per month with family discounts available. Not sure if Karate is for you? Come in and try a week of classes for free. If you decide to join, you will gain self esteem, self confidence, and a better understanding of yourself through physical training. If you decide not, you have lost nothing. Click on the form name for explanations of these forms! Our program uses eleven of these forms to take students progressively from beginner to black belt. The first form taught is Taikyoko Shodan, then all five Heian katas, followed by Kanku Dai, Bassai Dai, and Tekki Shodan. The last two forms are up to each individual student and are to be taken from the advanced forms list below. Although each student will vary, the average time frame for beginner to black belt is four years. Explanations for the Katas listed above are meant only as a guide and a reminder for those who train in these forms. They are not intended to replace a qualified instructor nor are they the written law for how to perform them. The movements of these forms are performed differently from style to style, and school to school, always check with your instructor about any variations. Any comments, suggestions, or to report a misprint, please feel free to contact me. Interested in swapping banners or URLs? Contact Leon Currier. Karate is an ancient martial art whose origins date back over one thousand years. Karate can trace its roots to the Chinese Shao Lin fighting art. The Shao Lin style arose from the training methods introduced by Dharma at the Shao Lin monastery. Designed to build strength and endurance, these methods helped the Shao Lin monks carry out their religion's strict discipline. Gichin Funakoshi was born in Okinawa in 1868, the same year as Japan's Meiji Restoration. Introduced to karate as a boy, Funakoshi's early training took place in complete secrecy -- at the time, the Okinawan government had banned the practice of karate. Funakoshi eventually became a schoolteacher, training in karate all the while. During this time, Okinawan karate emerged from its seclusion to become a legally sanctioned martial art. In 1922, the Japanese Ministry of Education held a martial arts demonstration in Tokyo; the Okinawan Department of Education asked Funakoshi to introduce Okinawan karate to Japan. Funakoshi did not get the chance to return to Okinawa. His demonstration made a powerful impression on the Japanese public; Funakoshi was soon beseiged with requests to further demonstrate and teach his art. Eventually, he had enough students to open a modest dojo in a Tokyo dormitory's lecture hall. Local universities began to take an interest in karate, and Funakoshi became a regular instructor at a number of them. The ranks of Funakoshi's students grew. Recognizing that the karate he practiced had diverged from the Chinese fighting styles, Funakoshi changed the meaning of "karate" from "Chinese hand" to "empty hand." ("Kara" can also mean "empty".) The change was important to Funakoshi: the "empty hand" concept not only reflected the fact that its practitioners used no weapons, it also recalled the Zen process of perfecting oneself and one's art -- by emptying the heart and mind of earthly desire and vanity. Funakoshi also set out to make karate more accessible to the public. He revised and streamlined the components of karate training, especially the kata, to make karate simple enough for everybody -- young and old, men and women. Karate began to spread throughout Japan. In 1935, Funakoshi's supporters had pooled enough funds to erect the first free-standing karate dojo in Japan. The dojo opened the next year, with a sign over the door bearing the dojo's name: Shoto-kan. In 1955, the Japan Karate Association was established -- Funakoshi's art had become a full-fledged karate organization. At the time, it was a modest one, with only a few members, a handful of instructors, and Funakoshi, who served as chief instructor. 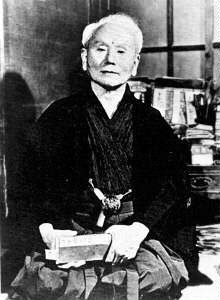 Gichin Funakoshi passed away shortly, in 1957. Since then, Shotokan students have carried on his spirit and teachings. The result: the JKA now has over 100,000 active karate students and approximately 300 affiliated karate clubs worldwide. Karate-do: My Way of Life, Gichin Funakoshi. "Karate -- Yesterday and Today," Dynamic Karate, Masatoshi Nakayama. Not only did this new name have close similarity to its ancient name of Tae-Kyon, but the name gave a new approach of nationalism to the art. Tae Kwon Do has been researched and developed in its style which is made up on ancient martial arts like; Taek- Kyon, Soo-Bak, T'ang-Su, Tae Kwon, Kwon-pup, and other various forms of Karate. A myriad of techniques have been added, especially in the variety of hand techniques and perfection of foot techniques. Above info is from a page on Columbia University's Taekwondo site.